The wedding cake was not something on the top of my importance list when I was planning the wedding. If you know me, you know photography was one of the main things that mattered to me. I just wanted to make sure the cake was delicious, and visually appealing! I'd thought of going the cupcake route, but was blinded by the price of the 3 tier cake at Wal-mart. I know, I know..Wal-mart? Really? [Note: You get what you pay for!] My grandmother had gotten an awesome birthday cake, and cake for our family reunion from Wal-mart. The designer was awesome and was able to do what she wanted, and they tasted delicious. I knew they were awesome at those cakes, but was unsure about wedding cakes. I looked up reviews online and found a mixture of reviews. There were good and bad. Though, since I'd tried the others I figured we could give them a shot. I now know, it's best to stick with them for sheet cakes, unless your event is in a room temperature 60 degrees or lower, which I will explain below. This is the cake I decided to order for our wedding. I thought that it looked modern and elegant. There was just something about the black and white. I loved it! However, our colors are purple and blue, so I asked for some minor changes. I asked if the ribbon bands could be changed to blue on the bottom, purple on the middle, and blue on the top. The designs would stay black. I had some small purple lilies that matched the bouquets to go on the top. This is the cake we received. I guess there was a misunderstanding as far as the color change goes. *sigh* They told me that the frosting on the bottom layer was left SO messy! Thank goodness for Ann for all that she did to help with cleaning the cake up! 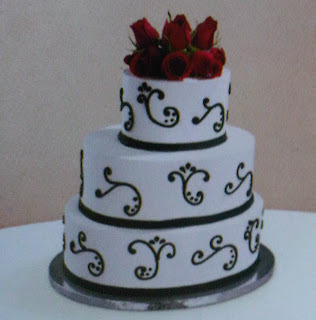 The frosting is buttercream, instead of fondant that's normally used for wedding cakes. Therefore, the cake started "melting" pretty much right away. The cake topper ended up falling about 3 times. The first time it not only fell but slid because the tier was leaning from the melting that was going on. It tasted good, so in the end I guess that's what matters. ^note the piece that broke off here too. 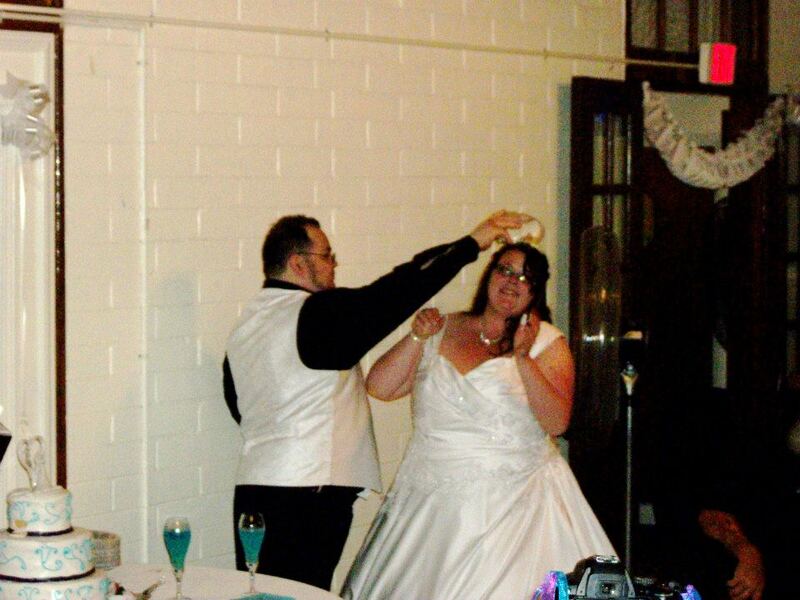 Apart from the above, and my groom throwing a piece on my hair. I had no other qualms with the cake. Like I mentioned, for birthday cakes, and the like (sheet cakes) Walmart cakes can be awesome; however, I would not recommend one for a wedding unless you are having a simple ceremony with a 1 tier cake!